After the intro, this album kicks off with its title track "3030". 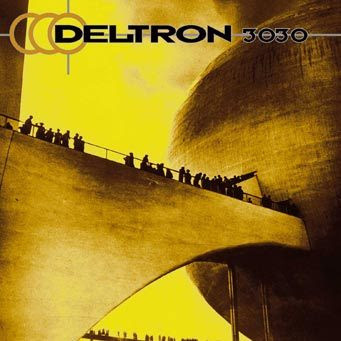 Though this 8 minute track is clearly the highlight of the album, the rest of the songs still stack up pretty very well, and do a great job of telling the story that is "Deltron 3030". The concept album premise is that Del Tha Funky Homosapien finds himself 1000 years in the future, trying to navigate his way though evil government run cities and over-powerful corporations, while also battling to be the Galactic Rhyme Federation Champion. Besides the whole "concept album" thing going on here, the most influential part of the album goes back to that same first track. "3030" is one of the only hip-hop songs I've ever heard that has real dynamic to it. The song changes and progresses as different samples and layers are added and taken away. This track manages to not get boring, not even for a second, throughout its 8 minute entirety. I also just read the fantastic news that all three original members, Dan the Automator, Del, and Kid Koala, are making a sequel to Deltron 3030, entitled "Deltron 3030: Event II". Download the album for free here, then anticipate the new one like crazy.